Research- it’s a great way to find out what’s going on in recruitment today. In the past few weeks, several reports have been released that give us a picture of where high school students are looking for information when searching for colleges. This research is a great way to see how recruitment is trending on a national level. In this post, we’ll talk about research from Noel-Levitz, Hobsons, and Stamats. These three reports offer a wealth of information about what students want from colleges and universities. It’s way more than I can talk about in just one post, so I’m just going to focus on the social media aspects of these reports. Beware, this data could possibly surprise you. The Noel-Levitz researchers surveyed more than 1,000 college bound high school students. The survey asked these students about what they do online, as well as their expectations of colleges and universities. Noel-Levitz’s E-Expectations sets the baseline for us by reporting what social networks are most popular among college bound students. As you can see, Facebook is a clear front runner at 76%. This wasn’t a big surprise. Facebook did just pass the 500 million user mark. The Hobsons report was conducted in partnership with Eduventures in March of 2010. 65,130 students from the United States (prospective undergraduates and recently enrolled students) were sent an online survey. Of the students who received it, 1,082 students completed the full survey. The Hobsons data is certainly interesting, and at first glance, it seems to contradict the Noel-Levitz report. 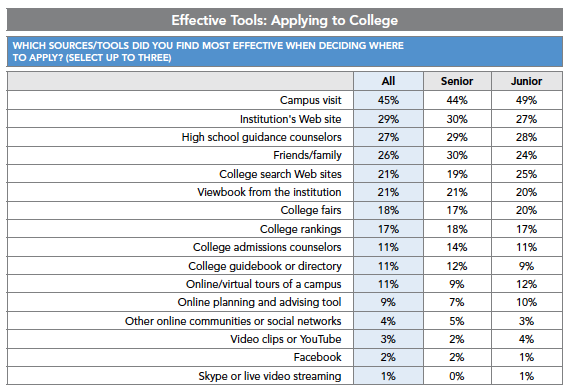 Students reported that Facebook and YouTube, the most used social networking sites according to the Noel-Levitz data, aren’t very effective with the college search and application process. Both barely even register on the scale with only 1% to 2% of respondents saying they consider Facebook or YouTube to be most effective. What’s even more interesting is their credibility. 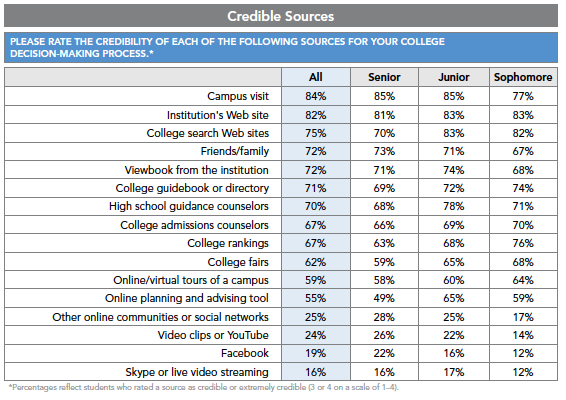 Only 19% of respondents found Facebook to be a credible source of information about a school. YouTube registered slightly higher at 24%. Karlyn wrote a great article about last year’s Hobsons report. You should check it out here. The findings from last year are pretty similar to this year’s results. Though the number has increased a few percentage points, it’s not a huge jump. 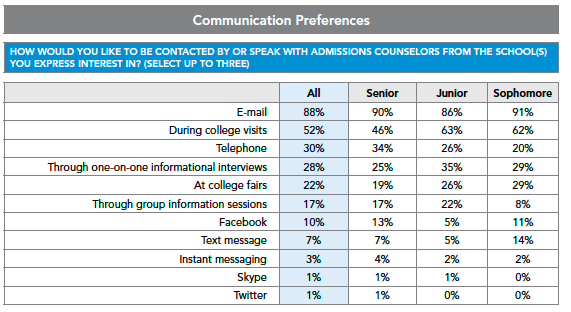 It’s also notable that very few students listed Facebook, Twitter, and Skype as a way they want admissions counselors to contact them. I think this makes sense. Social media is an awesome tool, but its never going to replace e-mails, phone calls, and college visits. Stamats TeensTalk report was generated from a nationwide survey of 500 high school students who will attend college as a first year freshman in Fall 2010. It was conducted at three times in the recruitment cycle: June 2009 (Summer), November 2009 (Fall), and February-March 2010 (Spring). 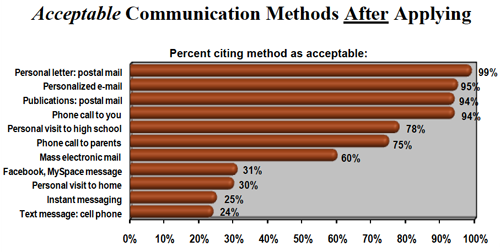 Stamats measured both acceptable and preferred methods of communication before and after a student applied to a university. The Stamats report seems to correlate with the Hobsons data when it comes to a preferred method of communication with a university. 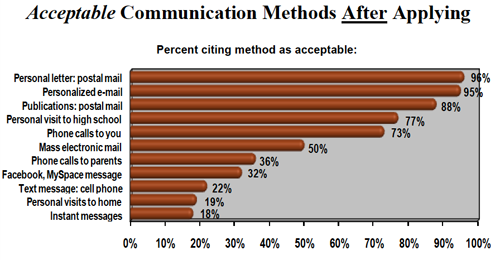 In these reports, Facebook and Myspace are not preferred methods of communication. In both cases, other forms of communication win hands down. You also may notice that the Stamats research shows that throughout the entire recruitment process, only 30% of students find Facebook and MySpace as acceptable forms of communication. Take a closer look at the summer data- that’s almost equal to a personal visit to their home among the students who have applied to a university. 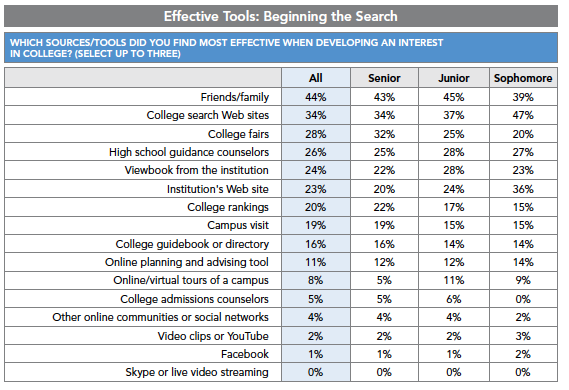 I believe this fits well with 33% of the Noel-Levitz respondents who actually looked for a school on a social media site. Well, what does it all mean?? Is social media a dead end? Should we reconsider our investment in these new emerging technologies? Should we totally dismiss these findings? The answer is a resounding no. Social media is certainly new, though not as new as it was a couple of years ago. It’s great that we are finally starting to see some real data on how it is being used. I think that the data is very telling about what students want. I believe there are a few reasons students are not using social media like we might expect them to. Think about what social media really is. Whether its farming on Farmville, posting pictures from that wild party on Facebook, or tweeting it up on Twitter, social media is a way for people to interact with each other and build relationships. When a student begins their college search, they aren’t looking to make friends with you right away. They want to find out what majors a school offers and what the price of their education would be. After all, they are shopping around. So it makes sense that students may not want to connect with schools on such a personal level right off the bat. I think that social media becomes important when students are making decisions after they’ve been admitted. It’s at this point that I think students are going to be most open to interacting with a school on a social network. It’s the icing on the cake that urges a student to take the plunge, so to speak. Schools aren’t utilizing social media like they could be. Earlier this year, Noel-Levitz released the 2010 E-Recruiting Practices Report which benchmarks the e-recruitment practices of schools across the country. In that report, social media is only being utilized by 38.9% of four-year public institutions, 26.1% of four-year private institutions, and 6.7% of two-year public institutions. More than half of the schools out there aren’t using social media in recruitment. Though the numbers have grown since last year, many schools still aren’t utilizing it. So there’s still a good chance that the schools which students are considering don’t have a social media presence. This could definitely affect how students utilize these sites for their college searches. Schools may not be using social media correctly. I know this is a rather vague point, but I wanted to mention it. There are lots of ways to use social media. However, since few schools are using it, there aren’t a lot of best practices to benchmark from. There are schools that just create a Facebook page or Twitter account and then post news stories from the university homepage. In some cases, no one monitors or engages the fans and followers. The key is to be social- that’s why it’s called ‘social’ media. In my opinion, engagement is the best way to build relationships with your fan base and followers. They aren’t going to answer their own questions, right? Once you’ve built that relationship, people will begin visiting and commenting more. It’s a feedback loop of social media goodness. Such interaction will lend more credibility to your social media ventures. As I said before, I think this data is good food for thought. The data may not be exactly what all of us wanted or expected to hear, but it’s data we should consider nonetheless. At the very least, the data gives us a view of how the social media story is playing out for all of us. This is not to say that we should use this data on a strategic or even tactical level. This is national data. It is not a rubber stamp for every university. It is certainly no substitute for your own internal research. When you do your own research, you have a chance to ask the questions you want to ask. You won’t wonder how the data was collected or how the results were tabulated. Conducting your own research allows you to think about what questions you want to ask, and sometimes the results from our research make us consider what questions we should be asking but aren’t. Every school is looking for a different kind of student. There are many ways to use social media. Do the research, find out what your prospects want, and adjust your social media strategy accordingly. Lougan Bishop is the Information Systems Assistant/Web Specialist for the Belmont University Division of Enrollment Services and is responsible for the implementation and oversight of multiple Hobson's EMT products. He assists the Offices of Marketing and Communications in the maintenance, design, and analytics behind the university websites. 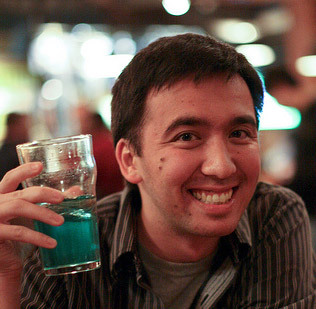 Lougan also pushed Belmont into the world of social media by creating the University fanpage and YouTube account in 2008, and formed a social media team in 2009. During his time at Belmont, Lougan has overseen the implementations of three CRMs, the AskBU knowledge base, chatBU university chat system, and the BU4U prospective student portal. He also provides support for the implementations of the graduate online application and the graduate E-Brochure. Prior to joining Belmont in 2008, Lougan was a Senior Sales Specialist with Dell, Inc. Lougan holds a bachelor’s degree in biology from Middle Tennessee State University. More and more, I’m of the mind set that social media is part of recruitment purposes only to reinforce the ‘brand’ in students’ minds. Its primarily useful in yield and retention purposes. This goes back to the applications vs enrollment discussion we all keep having. What’s the point of more apps if they don’t ultimately enroll? Yield is part of the equation, so, in a way, social media IS extremely useful in recruitment, if you define that as interest through enrollment. Which, I do. I still think social media could have its place earlier in the enrollment funnel. There are always the go getters that consider you’re school their dream school. Social media could definitely target them, the question is, who are they and are there enough of them to warrant the resources, I guess. I don’t think social media is a dead end. You’ve got an amazing amount of stats here but social media is still working for people so we shouldn’t give up on it just yet! Oh no, I don’t believe that social media is dead end in any way shape or form, however I think the more we direct our resources where it makes a difference is the smarter way to go about it. Smarter not harder they say. In order to work smarter though, you have to do your own homework to see where social media is most effective for your institution. I think that social media is useful for prospects because it gives them a glimpse of what the community might be like at that institution. Will students use social media solely to make a decision on where to go to school? I wouldn’t think so, so I’m really not surprised by the results of either survey. 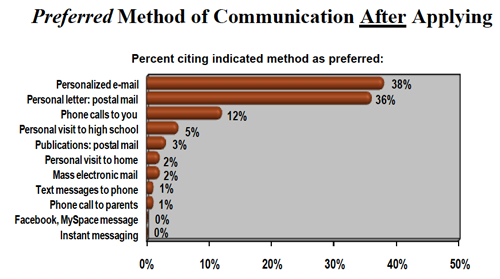 Students (and parents) still expect the “formal” communications to go along with the “formal” process of expressing interest in, and applying to specific colleges and universities. The role of social media is to develop a community that shows these prospective students what it might be like to attend there and belong to that group. Students aren’t thinking ‘what’s this brand all about’ when looking at a Facebook page - they’re thinking “hmm… would I fit in here? What’s this place all about?”. Social media can answer those questions for them. I’m seeing more and more prospective students comment on Facebook pages asking for input from other students who currently attend or have recently applied. It’s all in your perspective. I’ve been noticing the same. There are definitely prospects (the ones that are incredibly interested in your institution) would want to connect early through social media. After all, your institution is their dream school. Those students would be great targets for social media initiatives. The issue is, you have to figure out who those people are. Having the information about who those people might be, does way more for just your social media initiatives, but a heck of a whole lot for your entire marketing plan. Thats why I’m utterly intrigued by Predictive Modeling, because its one way to find out who these interested students could be. 1. The population size for all three of these surveys are small, so making broad statements or marketing decisions based on them might be tenuous. 2. Hobsons has a vested interests in these survey results as a higher-ed vendor, as they sell direct email services which might be threatened by a perception in the market that social networking communication is effective. 3. Stamats also has skin in the game here, as the majority of their business model is based on the development of college viewbooks and other marketing print material. I’d have to concur with Kevin Miller. Stamats surveyed 500 students, Noel-Levitz 1,000, and Hobson’s got an astonishingly poor 2% response rate. Academica Group’s annual survey of college and university applicants, the UCAS, surveys more than 150,000 applicants across Canada and the US, and tends to see a response rate of 20-30%. That being said, though, we’ve been monitoring student use of social media and their receptivity to hearing from colleges through it. 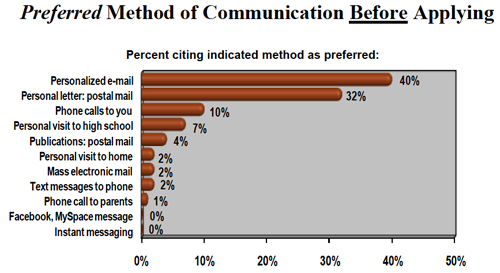 Generally, we find similar results — email, snail-mail, telephone are the ways applicants seem to expect to hear from colleges. But while they may not want to receive unsolicited instant messages, SMS texts, or Facebook pokes from a college, most are in agreement that it is appropriate for colleges to be present and available in the social media space, should the applicant wish to reach out to them there. So colleges need to be in the social media space to monitor what is being said about their brand, and to be available to prospective students. They just shouldn’t use social media as a sales mechanism. I just wanted to mention that all three of these companies are vendors. So you should definitely take that into perspective. It is true, Hobson’s does have a vested interest in their CRM products, but I also believe they also have a vested interest in social media. 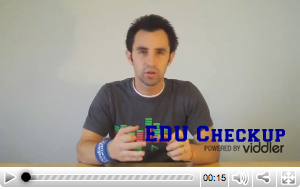 They own CollegeConfidential and have recently created an app for Facebook called mySchools. That should say something, right? Stamats is also investing heavily in their web marketing resources. I don’t expect they are attempting to underscore the importance of social media and the web. I totally agree. But I also think that Social Media can do much more than just brand and reputation management. Even beyond admissions, Social Media could certainly have an impact on retention by building relationships with at-risk students. I guess I think its more than marketing and admissions. I always think its interesting to see how social media can affect various markets. The trends that follow one usually follow for many others as well. Nice information as well. Just so I’m clear, the answer to the title of your post is overwhelmingly No, right? We can argue as much as we want about why that is but it’s hard to argue with the numbers. Unless there are tons of case studies of schools who can show that with better methodology social media actually can have a significant impact on enrollment I think it makes sense to question why schools would spend so much time using it as a recruitment tool. I personally think that social media can have a powerful impact on recruitment, but at the moment I don’t think that the schools have bought into the idea that it can. Considering we’re all new at using these tools, no one has really “done it right from the get go”. I have heard great examples of how to use social media from a stand point of yield. Rachel Reuben’s work with Cafe New Paltz is a good example, however, that is just one piece of the enrollment funnel. 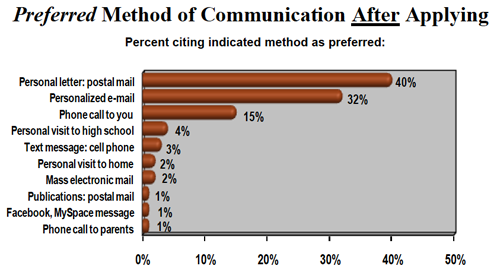 Many schools are still figuring out what percentage of print to email they should use. Throw social media into the mix and what do you get? A lot of confused admissions officers. We definitely need to be questioning how we use social media as a recruitment tool. At the same time, I think we also need to continually question our entire integrated marketing strategies. Everyone should be doing their own research into what their student’s want. But this will only give you a snapshot of what students want at that particular time. Can we really predict what they “will” want? I think that’s going to be the toughest question to answer. The scary fact is, social media is in constant flux, we have to look forward just as much as we have to look at the now. Lougan, It may be more important to survey prospective students who are the heavier users of social media to ask levels of importance than to ask the broader population of prospective students. We know that the vast majority of students have Facebook/Twitter accounts, but that doesn’t necessarily mean that they are active users. So, if an institution is not engaged in the use of social media as a recruiting tool (and a retention tool for that matter), are those institutions willing to blow off a piece of the market (active social media users) that may, ultimately be the kind of early adapters and community builders that you want on campus? On the opposite side of the scale: Is there a risk that the “social media addicted” may be the group that is more heavily influenced by an institution’s social media…are those the students that you are going after? I’d propose that we are not yet asking the right questions…and certainly the research presented here would have benefited from better sampling rates. I would also propose that ‘giving up’ is the last thing that any institution needs to do. The power of social media is far too strong to ignore but it may need better ‘harnessing’ to understand best practices when it comes to institutional use. Actually, Paul, the stats show that college applicants overwhelmingly have a Facebook account (and Academica’s study finds that they use it more than an hour a day) but every credible study I’ve seen clearly finds that applicants do NOT use Twitter. Twitter is still a platform for the middle-aged, sad to say. For mature students, perhaps even grad students, and certainly media reporters, Twitter is worth investigating. But until adoption rates change significantly, Twitter will do little for undergraduate recruitment. I think that even though Twitter has a low adoption rate at this time, it shouldn’t be ruled out completely. But from what I’ve seen, at least in our particular demographic at Belmont, that students do in fact use Twitter. More so than I’ve even expected. Belmont uses Twitter as an engagement tool. We search for mentions of the University and respond to those mentions. These are typically students that say “Wow, I want to go to Belmont” or “Hey, I’ve been thinking about Belmont” etc. With Twitter, we are able to personally touch these students, in a way we couldn’t before. Thus forming a stronger relationship with them. Now, granted we are only connecting with tens of prospective students through Twitter, a very small piece of the prospect pool. But if those students put in an app or pay a deposit, I think little work I do there will more than pay for itself. Thanks! I think the more we use social media, the better the questions we can ask. Everything is moving so quickly though, can we come up with the right questions as fast as the technology is changing? Happy to see the increasing emphasis on measurement and ROI in higher ed. But I think your last point is key. As the old adage goes: All politics are local. In our experience working in higher ed, local prospects often don’t behave the same way as many assume they would based on national data. Yes! social media is somewhat important not only for businesses but also for students. they can find lots of information via internet. This is a really strong article with some great stats. From my perspective as a UK IT Recruiter, Social media is a useful tool but has in no way overtaken some of the “traditional” methods of finding candidates or roles. It is good for finding out more about an employer with twitter and linkedin particularly helpful.